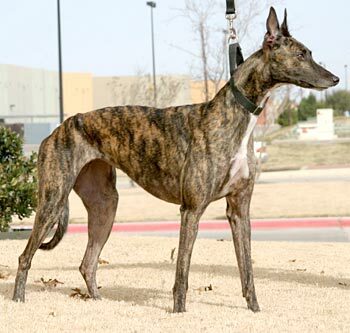 Breeze, aka Lucky Breeze, is a beautiful, 2½-year-old brindle female born June 25, 2005. Her sire is Craigie Whistler, making her grand sire Molotov, and her dam is WJS Nocturnal, whose grand sire is Wigwam Wag. 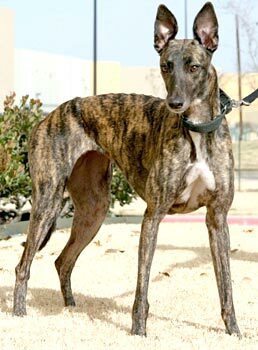 Breeze started her racing career at Valley Race Park in Harlingen on December 12, 2007, and finished after only 4 races on December 30, 2007. This girl is ready to find her forever retirement home! Breeze met the cat and was a little curious, but once Molly put her in her place with a hiss, growl, and some well-placed boxing moves, Breeze decided that her curiosity was curbed and she did not want anything to do with Molly again. We took her by the other cat, Pepper (who is always subdued), and Breeze was still not interested. Breeze in cat trainable using all the normal precautions. She will be tested with small dogs later.